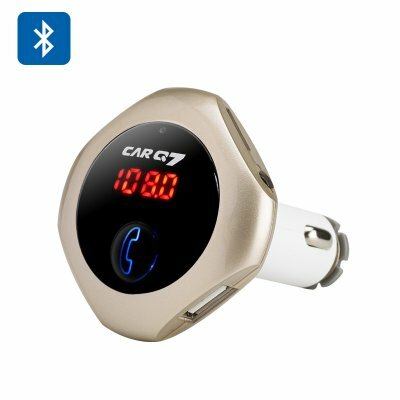 Successfully Added Q7 Bluetooth FM Transmitter - CVC Technology, LED Display, 32GB Micro SD Support, 2.5Amp USB Out to your Shopping Cart. Don't let your cars lack of Bluetooth hold you back, With this Bluetooth FM transmitter you can sync up your Smartphone to your cars stereo and listen to playlists, podcasts and conduct hands free calls thanks to the built in mic. Requiring just an FM transmitter this cleaver little gadget acts as a go between for your car stereo and Smartphone. simply tune the device and your FM radio into the same unused FM frequency and your can enjoy all the benefits of Bluetooth in your car without having to spend big bucks on a new stereo. Powered directly from your cars lighter socket this Bluetooth transmitter comes with two USB ports, this allows you to keep your phone and other gadgets charged via the 2.5amp output current as well as play music from a USB memory pen. Additionally this FM transmitter has a micro SD card slot supporting up to 32GB of storage so you'll have thousands of songs at your fingertips. A LED display and large buttons let you easily control the Q7 FM transmitter without it interfering with your driving so you concentration can remain on the road. This Bluetooth FM transmitter comes with a 12 months warranty, brought to you by the leader in electronic devices as well as wholesale car gadgets..